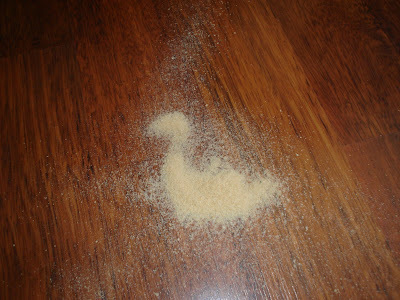 First Jesus in a pickle, now the Loch Ness monster in Cheerio crumbs...what next? 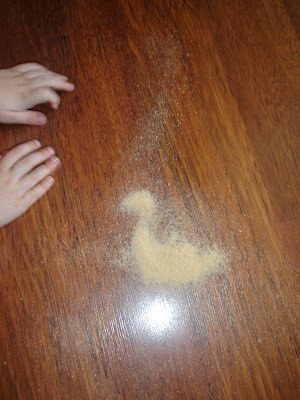 The Princess decided to dump the remnants of the Cheerios box on the floor, said "uh oh" (at which point I came bolting into the kitchen of course), took a peek down and couldn't even really lecture as Mr K and I kinda looked at it dumbfounded....and asked "How did you manage THAT?" hee hee hee, love it!! I've been to Loch Ness and I've met Nessie and THAT is NOT Nessie - THAT is a DUCK!!!!! I so agree with your little ones - definitely a duck!!!! I see a duck as well!!! Its got a hump in the middle of its back,looks like a camel with no legs.